The tiny Pacum compression bag vacuum invention can double the space in your suitcase. The Pacum is designed to work with standard compression bags (with the help of an adapter), drawing the air out in just one minute—four times faster than its counterparts. 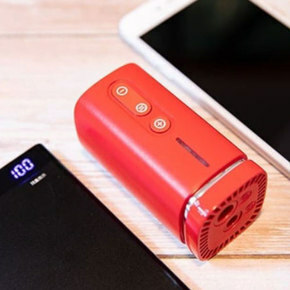 The handy little device is smaller than a smartphone, and features two pump modes, with Eco for smaller bags and Super to compress larger volume bags. The Pacum will stop automatically when the bag is properly compressed, and can also work as an air pump.